Katie Dawson and Chris Martin have done a lot of growing over the years. They have grown a family and two businesses, working together to make sure it all thrives. 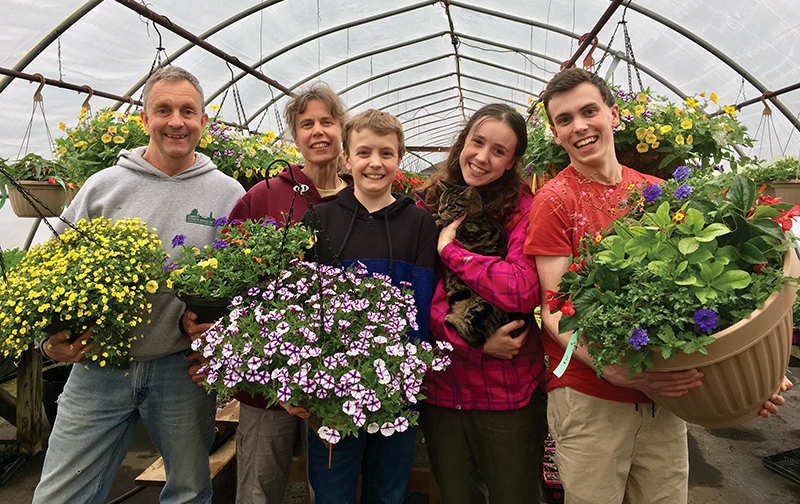 The nursery, Cut and Dried Flower Farm in Glencairn, is celebrating 25 years while the landscape business, Complete Outdoor Services, is turning 30. Dawson and Martin met 28 years ago while backpacking in Australia. They both had a background and education in horticulture, and Dawson says it was a natural decision to leave her native Scotland and start a new life with Chris in Glencairn. In 1993, she was a new horticulture graduate, and started growing hanging baskets, which she sold out of the back of their truck at the 400 Market on Mother’s Day. They now operate 10,000 square feet of greenhouses and a thriving family-run business that employs four people (Kieron Rupke, Kelly French, Cathy Cook and Val White) and has at one time or another involved their three children, Rosalyn, Daniel and Ben. Cut and Dried Flower Farms grows a full range of annuals, perennials, vegetables, herbs, hanging baskets, planters and shrubs. “Customers are definitely growing more veggies than ever before. This interest is in line with the national trend and is so exciting for us. Each year, we expand our range of veggies and fruit plants and they keep selling! We are so happy to help people become more self sustainable with their food,” said Dawson. With the advent of the internet, she says people have access to a wealth of information about plants, which has been one of the biggest changes they’ve seen. “The world has opened up for plant information. In the old days, I used to photocopy articles from gardening books and have them at the checkout for reference if customers needed growing information,” said Dawson. She says they have always strived to be environmentally conscious on their farm and have been at the forefront of earth-friendly trends such as using biodegradable pots and biological and cultural methods to help control pests and diseases. The farm offers a custom container planting service where customers bring in their containers to be professionally planted and grown at the farm. One of Katie’s passions is specialty annuals and she spends a lot of time researching and travelling to growers trials to check out new varieties to grow for the following year. Cut and Dried Flower Farm invites the community to its 25th birthday celebration, from 2 p.m. to 5 p.m. on Saturday, May 5 at 8530 Concession 3, Glencairn. Meet the family, staff and animals, partake in some birthday cake and refreshments, and vote in the staff hanging basket design challenge for a chance to win one of the creations and other door prizes.